According to November 2016 Pew Research, 77% of American adults have a smart phone. If we break down the age groups, you're probably not surprised to see 92% of 18 to 29 year-olds own a smart phone but what may surprise you is the increase among the older generation. 74% of Americans ages 50-64 (up 16% from 2015), and 42% of those 65 and older (up 12% from 2015) are now smart phone owners. I could go on and on with statitstics but you already know smart phones are everywhere. We just can’t put them down! We feel lost without them and will drive miles if we leave them behind. We take them everywhere and do much more than make phone calls with them. Yes, our phones are as mobile as we are and they seem to get smarter with each passing year. Over the last few years smart phone usage has increased dramatically. And why not? 4G (generation) technology and improved phone functionality have made web browsing from our phones much easier and faster. 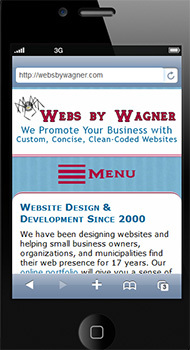 For the past few years, at Webs by Wagner we have been creating stand-alone mobile websites. We add redirect code to the larger, desktop version of your site so if a user has found your website on their smart phone or small tablet, they will be sent to the smaller, more concise mobile version. It all happens behind-the-scenes and the user doesn't even realize there is a separate, stand-alone mobile site. A responsive website differs from a stand-alone mobile site in that all the code is contained in one. The code detects the size of the user's device and serves up the proper page layout for that device. If some content is not necessary for the mobile user to wade through, we can use code to hide it for the mobile layout. We wanted to take a wait-and-see approach while the industry settled on the future path for mobile devices. Responsive websites seem to be the clear winner. However, your small business may still have a need for a mobile site because every business is unique. If your website is up-to-date and functional, a mobile version is perhaps all you need. Responsive or stand-alone mobile - you choose what is most appropriate for your business needs and we accomodate your needs. Google favors mobile-friendly websites. For the business owner, that means Google will serve up your mobile-optimized website over your competitor's non-mobile-friendly site to users when they are on their phone or small tablet. The giant search engine obviously considers many factors when serving up results for any given search, but it's important to understand that by simply creating a responsive or mobile-friendly version of your site, you will rank higher in Google's algorithm. It is worth your time and investment. 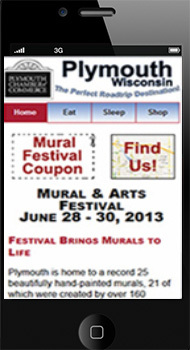 Your potential customers are using their phones to search for local businesses like yours. How can you enhance their mobile web browsing experience and turn them into your customers? The simple answer is, think like your customers. Think about them out and about, running errands, stopping for a bite to eat, waiting to pick up a child from soccer practice, or stuck in traffic. Are they picking up their phone to search for you? And if they do, what do they find? If they land on your full, desktop website where they must scroll up, down and sideways, pinch to zoom in and out, and navigate through way too much information, they may leave your site and go to a competitor who has made their site easy to use on a mobile device. A mobile optimized site will help you make a good first impression. It will tell the user you care about their mobile web experience and have taken the time to make it the best it can be for them. They will appreciate you! It's not important if you use your smart phone to search the web – it’s only important if your customers or potential customers are. You want to make it as easy as possible for them to find you, call you, and do business with you. A mobile website is not the same as your desktop website squeezed into the size of a smart phone screen. A user-friendly mobile site must be designed specifically for the small screen and feature your most important information. A website designed for a mobile device will provide the user with 'fat-finger-friendly' links and tap-to-call buttons, eliminating the need to manually dial the phone number of the businesses they wish to call. It also will load faster and use less of their monthly bandwidth limits. What are the most important actions users should take when they reach your site on their mobile device? Your mobile site must make those actions prominent and easy to execute. To provide major benefit to users, information must be easily found and presented in such a way as to encourage action. Users have become accustomed to mobile-optimized websites and they know immediately when they land on a non-mobile site, making it even more important for business owners to provide them with the best experience possible. If they don’t, users will find someone who does. 3) Enlarge buttons & links to accommodate "fat fingers"
Load speed and bandwidth usage are especially important for a mobile site. If a site loads slowly or the user becomes worried about their allotted bandwidth, they will leave your site. Now that 4G technology is available in more areas and mobile devices have improved functionality, increasing numbers of smart phone owners are browsing the web on their phones. They come to expect a 'smart' experience. If your website loads slowly or they need to hunt for the most important information, they will move on to your competitor’s site which doesn't bog them down or load slowly. It seems web history is repeating itself. In the early days of the web, it was acceptable to have an amateur-looking website. Now, people simply expect a website to function properly and look professional. If it doesn’t, they will find one that does. In comes mobile! Several years ago, it was cool to simply have your desktop website show up on a smart phone. Now, user expectations are higher. It's time to improve your mobile site's usability and load time. Things are only going to get worse – or better, depending on your perspective. Mobile and responsive sites will become the norm as business owners get on board with this new technology. No longer will users accept the full, desktop website on their smart phone, just as they no longer accept the out-of-date, amateur site on their desktop computer.